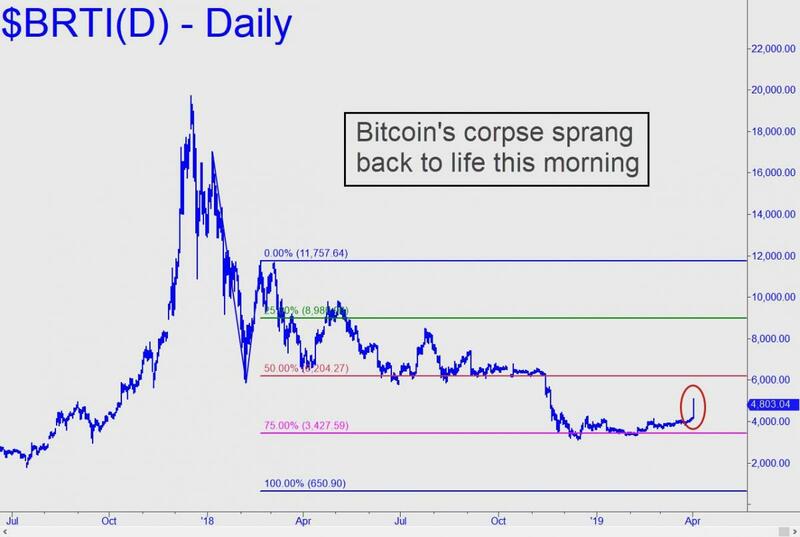 Bitcoin’s sharp rally on Tuesday was being described by some as a ‘mystery surge’, but it is no mystery at all for anyone who has seen the film Night of the Living Dead. Buffs may recall that the movie’s flesh-eating zombies were activated by radioactive contamination from an exploding space probe that had visited Venus. Although no similar explosion has been reported by NASA, it seems entirely logical that some sort of cosmic contaminant affected the brains of traders, causing them to pay $900 more for Bitcoin than anyone had been willing to pay the day before. On a chart, the cryptocurrency looks like it sat on a Whoopee Cushion. Cosmic rays aside, another plausible explanation is that the imbeciles who bought into the rally simply forgot about myriad factors that have been weighing on bitcoin for the last 16 months, pushing it 75% beneath the December 2017 high of around $20,000. If a score of high-profile embezzlement and theft scandals weren’t enough to ward off thrill-seekers, the recent announcement that the Cboe, the first exchange to list bitcoin futures, plans to kill the contract after June should have slowed the action to a death crawl. Instead, we got enough of an effusion on Tuesday that more speculators could get sucked in over the next few days. Some called the rally an April Fool’s joke. Indeed it was, no matter what its actual cause. Click here for a free two-week trial subscription that will give you access to all paid features and services of Rick’s Picks, including daily, actionable trading recommendations and a ringside seat in a 24/7 chat room that draws veteran traders from around the world.